This was our second week learning about Japan and the girls had a lot of fun with many "hands-on" activities: origami, watercolors, calligraphy, puppet theatres, and Japanese screens. Much reading and even a great video or two thrown in. Since Japan has over 70 volcanoes, we are going to be doing a unit on volcanoes next week - as requested by the girls! We used Kids Web Japan to look at the history of kimonos different types of kimonos and had fun doing a virtual game dressing girls and seeing where they would wear the kimono and outfit that we picked for them. Japanese screens ~ Each of the girls designed their own Japanese screen trying to follow each of the four seasons. Made a fun little Japanese counting booklet and practiced our calligraphy. We first read The Paper Crane (Bang) and then picked out a few pieces of origami to make: a mask and a boat...fairly simple but fun! The girls colored and put together their own Banraku puppet theatre. We found some great links on youtube to see some theatre in action too. Japanese Children's Favorite Stories (Sakade) - read aloud stories to the girls. 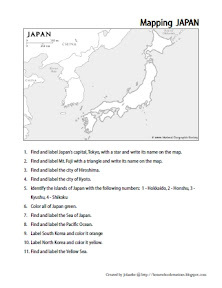 Smithsonian Education - included 3 different lesson plans about Japanese art, screens, etc..